The known world has its share of warriors, and then there are those that have had more than enough of the misdeeds of others that they are forced to take matters into their own hands. The Sword of Khonsu are holy warriors that actively seek out those that would hurt or harm any that have no ability to protect themselves. They are in many ways like the paladins of many of the varied religions, but in the case of the Sword of Khonsu, they are more than willing to do things that would traditionally stay the hand of a paladin in the pursuit of justice. 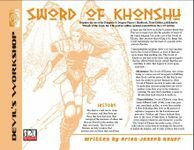 This four page Sword of Khonsu Prestige Class PDF is an easy-to-integrate PC class and just the sort of thing needed for DMs to add depth to any great d20 fantasy campaign world and gaming session.